Today is the first Friday of 2015 and greetings are being received from various people by Hazrat Khalifatul Masih for the New Year both in person and via fax and Huzoor himself sent his greetings to everyone. Mutual New Year greetings would be only be beneficial when we reflect to see how much we fulfilled our obligations of being an Ahmadi last year and how much we will try to do in the New Year. This Friday onwards resolutions which would create alertness and effort in the New Year should be made. It is obvious that the tasks we are expected to do as Ahmadis can only be done through virtue and piety. However, the question is what should be our level of piety and virtue! It should be clear to everyone who joins Ahmadiyyat or is an Ahmadi that the Promised Messiah (on whom be peace) ascertained these levels for us. And now with all the resources and technology available every Ahmadi pledges at least once a year on the hand of the Khalifa of the time to make his best efforts to attain the levels as explained by the Promised Messiah (on whom be peace). Indeed the expected levels for Ahmadis have been explained in the conditions of Bai’at. Although the conditions of Bai’at are ten, however, broadly speaking they carry more than thirty responsibilities laid on Ahmadis. If true happiness is to be commemorated at the start of a New Year these responsibilities should be kept in view. It is not sufficient to be delighted at having accepted the matter of death of Jesus (on whom be peace) or to have accepted the one who was promised to come. Indeed, that is the first step but the Promised Messiah (on whom be peace) expected us to have an in-depth understanding of virtue and piety and to practice it. And to avoid sin as one avoids blood-thirsty beasts. Then alone will we be able to bring about a revolutionary change in ourselves and also become a source to change the world and bring it closer to God. The details of this matter need to be reiterated and reminded as this reminding is very important. The first pledge we make [in conditions of Bai’at] is to avoid shirk (associating partners with Allah). When a true believer believes in God and due to this belief also accepts the Imam of the age, he does not even have anything remotely to do with shirk. The shirk referred to by the Promised Messiah (on whom be peace) is not obvious idolatry. Rather he refers to that imperceptible shirk which weakens a believer’s faith. The Promised Messiah (on whom be peace) said that Unity of God does not simply mean verbally professing there is none worthy of worship except Allah while having thousands of polytheist thoughts in the heart. A person who gives any task of his or any planning, scheming or effort the same reliance and significance which is only due to God or gives weighty significance to his own self that is only due to God is an idolater in the eyes of God in all these instances. Idols are not only figurines made of gold, silver, copper or stone which are then relied on. In fact everything, every word, every practice which is ascribed the magnitude of significance which is only due to God is an idol in the eyes of God. We need to self-reflect today whether we considered material things everything last year or did we only use them to plan and practice and sought all good and blessing from God. Fair-minded self-reflection would give us the answer. Then, the Promised Messiah (on whom be peace) took pledge from us that we would keep away from falsehood. Which sensible person would say that falsehood is good or they want to say falsehood! The Promised Messiah (on whom be peace) said that unless a selfish motive spurs him no one wants to tell lies. Thus, selfish motives and interests drive one to tell lies. However, high morals mean that even if one’s life, property and honour is at stake one does not tell lies. Difference between an honest and dishonest person becomes evident during trials and tribulations when an honest person speaks truth even when his personal interests are at stake. Currently people seeking asylum here and in Europe indulge in falsehood on the behest of lawyers in spite Hazrat Khalifatul Masih’s repeated admonishment in this regard. They make up stories and yet cases of many are still rejected. Here and in the rest of the world a central team of lawyers has been formed which helps asylum seekers, guides them regarding lawyers and offers consultation. Their president often reports that asylum case of such and such was rejected because it was based on a lot of falsehood. Lies were told for worldly benefits without thinking that God has mentioned shirk and falsehood in conjunction. Then there are some who use falsehood to get [welfare] benefits from the government. The Promised Messiah (on whom be peace) said that falsehood is like idolatry and one who relies on it abandons reliance on God. The Promised Messiah (on whom be peace) also took pledge to keep away from fornication. He said do not go near fornication. That is, stay away from such functions which could even trigger the thought of it and do not adopt the ways which have risk factors as regards these sins. These days lewd films are shown on television and the internet or can be accessed on it. This is fornication of the eyes and thoughts and also a source of getting embroiled in bad practices. They also cause break ups of homes. Women and girls write in about their husbands watching lewd films on the internet all day and some husbands also write about their wives. Matters reach khula or divorce. These films also lead people to behave worse than beasts. Ahmadi society is generally free from this apart from the odd case. However, if an all-out effort is not made to safeguard oneself while living in this environment no guarantee of chastity can be given. There is need to reflect over this with due concern. Another pledge sought by the Promised Messiah (on whom be peace) is to stay away from trespasses of the eye. The Holy Qur’an commands غض بصر (ghadd e basar) restraining of the eye and the Holy Prophet (peace and blessings of Allah be on him) said that Fire is forbidden to that eye which restrains from looking at what God has forbidden. The Promised Messiah (on whom be peace) said: We have been positively commanded not to look at women outside the prohibited degrees (not a close relative) and their beauty. He said unrestrained looks always end up in stumbling at times. God has sent this excellent teaching because God wills our eyes, hearts and intentions to remain pure. Islam has enjoined these boundaries on both men and women. Just as women are commanded to observe purdah, men are commanded to observe غض بصر . We should reflect as to how much we practice this! The Promised Messiah (on whom be peace) took pledge that we would stay away from all manner of wickedness and debauchery. Indeed it is wicked to astray from what God has commanded. The Holy Prophet (peace and blessings of Allah be on him) once counted abusive language as wickedness/debauchery. The Promised Messiah (on whom be peace) once said that it is proven from the Holy Qur’an that a wicked and debauch person should be punished before a pagan. When Muslims exceeded in debauchery and wickedness and disrespected and reviled commandments of God and were lost in the glitz of the world then God also destroyed them through the likes of Halagu and Genghis Khan. The situation is the same today among Muslims! Another pledge sought from one taking Bai’at is that he will stay away from cruelty. Cruelty is indeed a big sin. The Holy Prophet (peace and blessings of Allah be on him) once thus described a big sin: If a person usurps even a hand span of land from his brother, the entire land underneath even a small pebble of the land usurped will be placed as a millstone around his neck on the Day of Judgement. It is indeed a grave cause for concern when owing to egotistical and personal interest people usurp others in court cases. This is something we need to reflect on. The Promised Messiah (on whom be peace) also took pledge that we will stay away from خیانت (khiyanat) dishonesty/breach of trust. The standard of how to practice this was thus set by the Holy Prophet (peace and blessings of Allah be on him): do not even practice خیانت with someone who has done خیانت with you. Therefore no excuse is warrantable to commit خیانت . If Ahmadis usurp you, consult the Qadha Board and if anyone outside the Jama’at usurps you or the Jama’at advises you, take legal action. Another pledge taken from us is that we will stay away from mischief and disorder. While there is no question of mischief and disorder with our own, the teaching of the Promised Messiah (on whom be peace) even regarding others who are oppressing us is: Do not clash and confront those who leave you and abandon you because you have joined the community established by God. Rather, pray for them privately. You see, I have been commissioned to repeatedly instruct you to always avoid where there is disorder and chaos. Be steadfast when verbally abused and respond to badness with goodness. It is best if you move away from a place where someone is inclined to create disorder and mischief and respond gently. I do not like it at all when I hear that a person from this Jama’at has altercated with someone. God Almighty too does not want a community which is to be a role-model for the world to adopt a way which is not the way of righteousness. If this advice of the Promised Messiah (on whom be peace) is kept in view as regards treatment of wives, brothers and in general we would not have any of the few cases the come to light or there would be an extraordinary decrease in them. The Promised Messiah (on whom be peace) also took pledge that we would keep away from rebellion. Be this against an ordinary Jama’at worker or government of the day! Aside from in matters where the government meddles in someone’s religious affairs it is not Islamic to have this attitude with the government and take law in one’s own hands or incite others. We are also enjoined not to get carried away by passions. There are many chances to get carried away by passions through television and internet, in addition many quarrels and conflicts stem from this. It is an Ahmadi’s duty to avoid even the smallest of matters that inflames passions or makes one get carried away. The Promised Messiah (on whom be peace) said that after joining Ahmadiyyat pledge to offer five daily Prayers/Salat with all their requisites. Salat is obligatory on a ten year old child and parents should supervise in this regard. This can only be fulfilled when parents also offer Salat with due care. Many complaints are received regarding this matter; some children say their parents do not offer Salat or wives say husbands do not offer Salat. For men ‘offering Salat with its requisites’ means to go to the mosque five times a day unless when not feeling well or due to a genuine excuse. If this was practiced our mosques would fill up. If only the office-holders started following this it would make a huge difference. Effort is required in this matter and the Jama’at and the auxiliary organisations need to pay a lot of attention here! The Promised Messiah (on whom be peace) said if a man wishes to forego Salat then he has not achieved much more than animals. Pledge is also taken from us to organise offering Tahajjud Salat. Tahajjud should be organised because it was the way of the earlier righteous ones and it is a source of gaining closeness to God. This practice keeps one away from sin and removes bad habits and also keeps one away from physical ailments. The Promised Messiah (on whom be peace) said our Jama’at should offer Tahajjud. Our Jama’at should be regular in Tahajjud. If not much they should offer two units of Prayer. Attention need to be given to this matter! The Promised Messiah (on whom be peace) took pledge to invoke درود Durud (salutations and blessings) on the Holy Prophet (peace and blessings of Allah be on him). The Holy Prophet (peace and blessings of Allah be on him) said: Allah will send mercy ten-fold on one who invokes Durud on me. Hazrat Umer (may Allah be pleased with him) said: Prayer is suspended between the earth and the heavens and unless Durud is invoked on the Holy Prophet (peace and blessings of Allah be on him) no part of the prayer proceeds upwards. Another pledge we make at Bai’at is that we will be regular in استغفار Istighfar (seeking forgiveness) for our sins. The Holy Prophet (peace and blessings of Allah be on him) said that God makes a way out of adversity and into prosperity for a person who engages abundantly in استغفار and provides for him from means that are beyond his imagination. The Promised Messiah (on whom be peace) said: Some people are aware of sin while some people are not aware of sin. This is why Allah the Exalted has always prescribed to seek استغفار . So that man says استغفار for every sin whether it is apparent or hidden and whether he is aware of it or is unaware of it. Thus, the significance of استغفار should always be in our view. Another pledge is that we will always remember God’s bounties. The greatest bounty is that He enabled us to accept the Imam of the age. If we are mindful of this bounty we will be drawn to forge a sincere connection with the Promised Messiah (on whom be peace) and will be drawn to practice his teachings. We also pledge to praise and glorify God. The Holy Prophet (peace and blessings of Allah be on him) said that any important task that is begun without praise and glorification of God is not blessed and is not effective. And a person who is not grateful for receiving a little is also not grateful for receiving in abundance and one who is not grateful to people is also not grateful to Allah. Thus, we should glorify God in a manner that we are also grateful for His creation. We also pledge not to cause harm to God’s creatures. We also pledge in particular not to cause undue harm to Muslims due to our passions and that we will forgive as much as possible. However, where it cannot be helped and others exceed in limits with their persecution, we will inform the authorities. This will be done for reformation and will not be borne of any personal enmity or anger. Reformation will be done by those in authority and there will be no personal settling of scores. Rather one should assume humility and meekness. We have also pledged that we shall remain faithful to God under all circumstances. The Holy Prophet (peace and blessings of Allah) said: Matters of a true believer are amazing. Everything he does is full of blessing. This grace is exclusive to true believers. When he receives special happiness, joy or propensity he thanks God and his gratefulness garners him further blessings. When he receives pain, hardship or loss, he is steadfast and this stance also becomes a source of grace and blessings for him because he is rewarded for his steadfastness. Indeed, a true believer runs to God in every situation and this way the pledge of accepting pain and indignity in the path of God is also fulfilled. The Promised Messiah (on whom be peace) said: Those who are mine cannot be separated from me; neither due to problems and persecution by people nor heavenly trials and tribulations. We are going to be with the Promised Messiah (on whom be peace) for the sake of God and will endeavour never to care for any indignity or pain in this way. This is our pledge. We also pledge during Bai’at not to follow un-Islamic customs. The Holy Prophet (peace and blessings of Allah be on him) said that if a person initiates a custom in the name of religion which has nothing to do with religion, that custom is accursed and unacceptable. We should be very vigilant in this regard. Many erroneous wedding customs have been created which should be avoided by Ahmadis and we should not let ourselves be influenced by what is taking place around us. Hazrat Khalifatul Masih has elucidated this matter in details before. Secretaries tarbiyyat and Lajna should bring this matter to the fore time and again so that members of the Jama’at are protected from these matters. Another pledge is to refrain from lustful inclinations. The Promised Messiah (on whom be peace) said: ‘Paradise is the station for a person who fears standing before his Lord and suppresses his self-absorbed desires. Suppressing one’s lustful inclinations is completely devoting oneself to Allah. Through this a person attains pleasure of God and reaches Paradise in this very world. Another pledge is to completely submit to the authority of the Holy Qur’an. The Promised Messiah (on whom be peace) said: Stay alert and do not even take one step contrary to the teaching of God and the Holy Qur’an. I say to you most truthfully that a person who evades even one commandment from the seven hundred commandments of the Holy Qur’an closes the door to salvation with his own hands. We pledge that we will make every Word of God and the Holy Prophet (peace and blessings of Allah be on him) our guiding principles. The Promised Messiah (on whom be peace) said: We have only one Prophet and only one Qur’an which was revealed to the Prophet (peace and blessings of Allah be on him) and by following which we can find God. Another pledge we take is to adopt humbleness. The Holy Prophet (peace and blessings of Allah be on him) said: Whoever adopts humbleness and meekness for the sake of God is exalted by God so much so that he is given place in the highest station of Paradise. We also pledge to always remain cheerful. This should always be kept in view by everyone. We also pledge to spend our life in forbearance and meekness. The Promised Messiah (on whom be peace) said: If you wish to find Allah the Exalted look near the hearts of the meek. The Promised Messiah (on whom be peace) took our pledge that we will hold faith and the cause of Islam dearer than our own life, property and honour. Another pledge is to always be of service to God’s creatures for His sake. The Promised Messiah (on whom be peace) said: Remember, Allah the Exalted loves piety and wishes that His creation is cared for. Those of you who are connected to me should remember to care for every person regardless of which religion he follows and should be good to everyone without distinction because this is what the Holy Qur’an teaches. Another pledge is to endeavour to benefit mankind to the best of our God-given abilities and powers. The Promised Messiah (on whom be peace) said that mankind has many needs and due to various reasons some are dependent on others. Purely for the sake of God one should try most sincerely, selflessly and with true compassion to benefit mankind as much as one can. One should help anyone in need of help with one’s God-given capacities and try one’s utmost to make better their life in the world and the Hereafter. The Promised Messiah (on whom be peace) took pledge that for the sake of God we will enter into a close bond with the Promised Messiah pledging obedience and devotion to him as is not found in any other worldly relationship and connections demanding devoted dutifulness. That is, we will obey him in everything he has advised us for our own betterment and which is relayed to us after him by his Khulafa. These matters are to establish Shariah and are based on the words of the Holy Qur’an and the Holy Prophet (peace and blessings of Allah be on him) and his blessed model. Without this neither can we progress nor remain united. May God overlook our weaknesses of last year and enable us this year to make utmost efforts to mould our lives according to the expectations of the Promised Messiah (on whom be peace). Two funeral Prayers in absentia were announced. Luqman Shehzad Sahib Shaheed was martyred in district Gujranwala, Pakistan early in the morning after Fajr Prayer on 27 December 2014. Shaheed was the only Ahmadi in his family and had taken Bai’at in 2007. Prior to Bai’at he met with Ahmadis in the area and forged a deep connection. 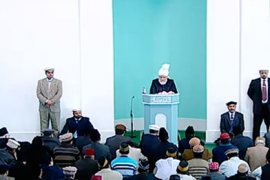 He started viewing MTA in general and Friday sermons in particular which led him to become Ahmadi. He faced intense opposition and huge efforts were made to dissuade him from Ahmadiyyat but he remained steadfast. Once his uncle took him to a local mosque where Maulawis tried to persuade him to renounce Ahmadiyyat. On their insistence Shaheed said if they could come up with reasoning and proofs he would reject Ahmadiyyat. The Maulawi replied: this is no time for argument, just reject it. Shaheed did not agree. They all beat him up injuring his back bone and threw him in a vehicle and imprisoned him in an animal shed. They released him only after his mother repeatedly pleaded his uncle. Shaheed was then forcibly sent to his father in Saudi Arabia so that he could be dissuaded from Ahmadiyyat. He was also mistreated in Saudi Arabia. While there he looked for Jama’at and was delighted when he made connection. He also performed Hajj while in Saudi Arabia. He returned to Pakistan after three years and started working on land. On 26 Nov 2014 a Khatm e Nabuwat Conference was held in his area attended by so-called Maulawis from all over the country who passed edicts of Ahmadis being ‘liable to be killed’ and particularly incited people against Luqman Shaheed. On 27 Dec 2014 as he was returning after Fajr Salat opponents attacked him. He was rushed to hospital but was martyred on the way. Shaheed was born on 5 April 1989. He was an honest, pious, cheerful and sociable person. He was an extremely devoted Ahmadi young man and was currently serving as local secretary finance. He was very keen on Tabligh and said that he would be content after all his family became Ahmadi. May God elevate the station of Shaheed and grant him an excellent place in high Paradise and enable his family to accept Ahmadiyyat. Shehzade Satanos from Macedonia passed away on 19 Nov 2014 at the age of 49. She accepted Ahmadiyyat in 1996 a few months after her husband. They had been married for about eleven years at the time but did not have any children. The Ahmadis who did Tabligh to them requested Hazrat Khalifatul Masih IV (may Allah have mercy on him) to pray for them and God granted them a son. They experienced a lot of opposition after accepting Ahmadiyyat but Shehzade Satanos remained steadfast. She did not know Salat before accepting Ahmadiyyat but gradually became a very active Muslim and eagerly participated in Lajna programmes and read Ahmadi books in local language. We do not have a centre in Macedonia therefore her body was taken to a non-Ahmadi establishment for washing. They seized her body and created uproar over returning it. Ahmadis could not offer funeral Prayer for her. Her husband showed great patience and fortitude over this matter, did not fight back and thus avoided possible disturbance. May God forgive her and elevate her station and continue to increase her family in their sincerity.